Excellent comforter. Just as expected. Stunningly elegant, the Madison Park Marcella 7-piece Comforter Set offers an eye-catching update to your bedroom decor. A beautifully intricate damask pattern, in indigo and white hues, is flaunted across the comforter for a chic transitional look. A solid indigo reverse perfectly complements the top of the bed, while the flange border adds a charming accent to the comforter. Two coordinating shams mirror the look of the comforter and feature an added flange border accent. To complete the bedding set, three decorative pillows with embroidered details and fabric manipulation are included. Made from 100-percent cotton sateen, this comforter set is machine washable and gives your bedroom a lavish allure. It’s really pretty on my bed but doesn’t cover enough on my king size bed. I have a 14inch matress and isn’t long enough. I have washed it once and noticed a small hole. Didn’t hold up well at all. 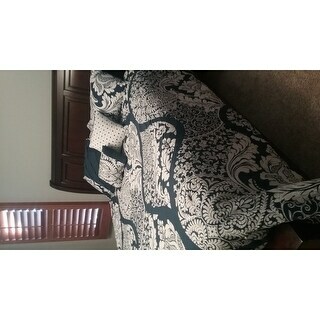 Love this comforter, keeps me nice and warm and went well with my drapes. This print makes a statement and looks like a designer picked it out. The throw pillows are pretty decent, we use one or two on the bed and one or two on our chaise lounge. 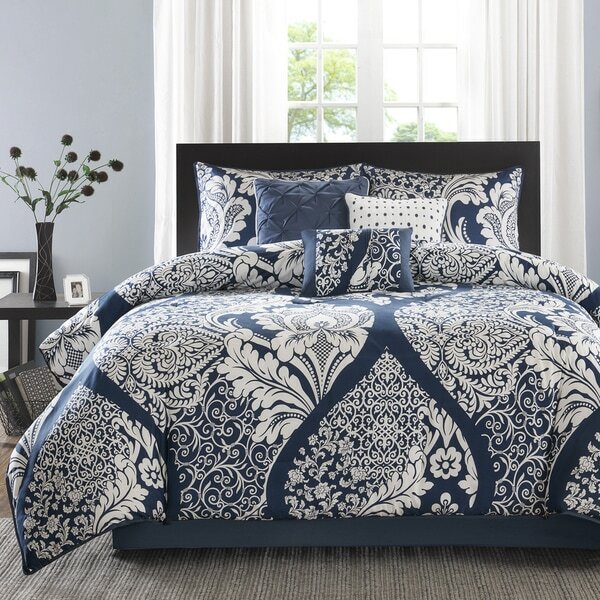 The Madison Park Marcella Indigo Cotton Print Comforter set makes me so happy! The colors and look are exactly as shown in the photos, and the set is even more beautiful in person. The cotton fabric is heavier and more sturdy than most cotton comforters, which I appreciate and know it will have a long life. My husband loves the set too and even exclaimed, “Wow!” when he saw it. The comforter feels light on the bed, but is actually quite warm. The pillows are nicely made, but a bit small. My only wish is that Euro shams had been included, so I am buying a couple separately. Would 100% recommend this set! The pattern and royal blue color are eye catching as you walk into the room. The throw pillows are perfect for the quilt design. The weight of the comforter is light but that’s OK for us because we use it as a bedspread. The only issue we have is that we wish it were a couple inches wider. However, we think it will be just about right when we take off our down comforter when the weather gets a bit warmer. Great colors and looks expensive! The deep blue is gorgeous with the white. It looks great on my sleigh bed! I bought a king size for my queen, and this seems to be the right size for extra comforter. I am not using the bed skirt. 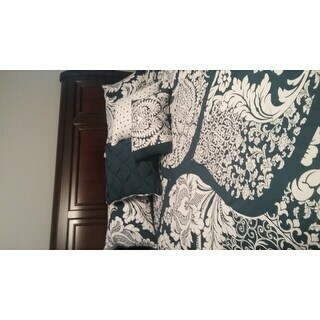 We have been really happy with this comforter set. We ordered the queen and it fits nicely. The product is well made and will last a long time. No complaints. 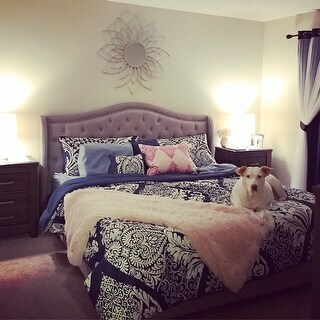 I am very happy with the comforter set! I like the pattern and style. Most of all I was delighted to find a comforter set that was all cotton! I ordered the King size set for my Queen size bed. I don't used a bed skirt so it gives more comforter on each side and still shows off the wood on the bed frame. 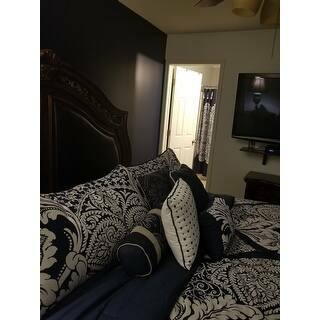 The only thing I didn't like was the King size pillow shams don't fit my Queen size pillows. However, I tuck the extra fabric under the pillow and you don't even notice! Bought this for our guest room, and it just MADE the room. The colors are vibrant and look great on the bed...my only guest far has told me it's cozy to sleep under. It washed up nicely after they left. Another great overstock purchase! Absolutely Beautiful and vibrant!!!! Navy and white are true to pictures!! Unfortunately this bedspread fell a little short for me. It took 11 days to be delivered and the fabric is that thick dorm room type. I don’t know what I’ll do when it needs to be washed because I doubt it will hold up. Also, ours is a king and the sides are very short (I push everything to our left most prominent side). 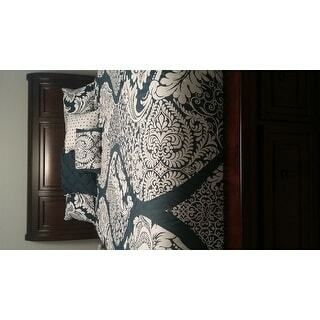 Pretty comforter set. The navy is a true navy. I wish this was a little softer and more satin-like but a nice set with good decorative pillows. Looks nice, good quality, have gotten lots of compliments. Highly recommend. We love this bedding set and our little dog approves too! It is so soft and really makes the room look good! Beautiful set. Fits the bed well, fluffy and soft. Machine washable! Love this Comforter Set.. 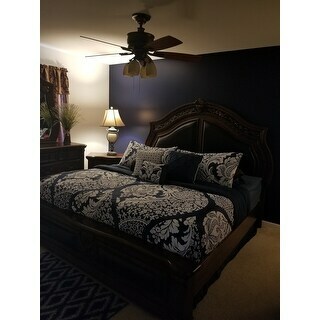 The blue color looks so vibrant make the bedroom so elegant. I bought this for my daughter. She loves it! It’s so comfortable and beautiful. Definitely makes her room look more inviting. I am kind of jealous and wish I would have gotten it for my bed. I would recommend this comforter to everyone. So soft! My son got this for Christmas and he loves it so much. You can't go wrong with the material - it's awesome. I love the pattern too. Nice color . feels nice and worm . "Does item #19752498 king size set come with KING SHAMS?" Yes, the king size does come with king shams. 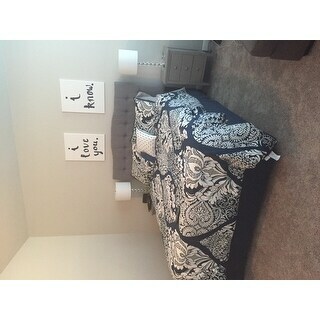 "How soon will you have this comforter set in full or queen? Thank you! I love it!!" "Is there window treatment to go with this Comforte? Ms"
Not with the exact same print. "Is the comforter better suited for summer or winter?" I would say more for winter, quilts are more for summer and spring. "Is this a dark navy or more royal blue?" The comforter is not quilted. 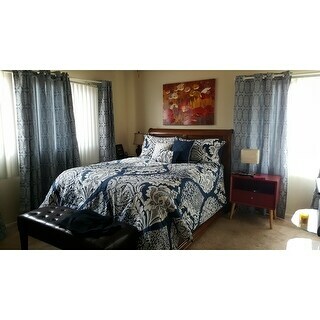 It is an elegant looking comforter at a very reasonable price. I remolded my guest room and it looks great with the new flooring and room color. "What are the dimensions of the California king ?"